For the past two years, we’ve posted lists of the 10 best visual effects breakdowns of 2016 and 2017, as selected by our Facebook followers. They’ve proven very popular, so we’ve compiled a new list for 2018. Below, we’ve taken the breakdown videos that got the most interactions – views, reactions and shares – on the CG Channel Facebook feed, and divided them into 10 categories, from movies to student shorts. Unlike last year, neither idents or real-time projects featured heavily in the long list, but there were a lot of very strong technical demos, so we’ve updated the categories to reflect that. It goes without saying that all the CG on display is excellent, but bear in mind that this isn’t a rundown of the biggest or best movies or TV shows of 2018: it’s a run-down of the best breakdowns. Editing, presentation, and the quality of the making-of material on display all count for a lot here, too. Black Panther and Avengers: Infinity War both made strong showings, but by far the most popular VFX breakdown of 2018 was of DNEG’s Oscar-winning CG environments for Blade Runner 2049. 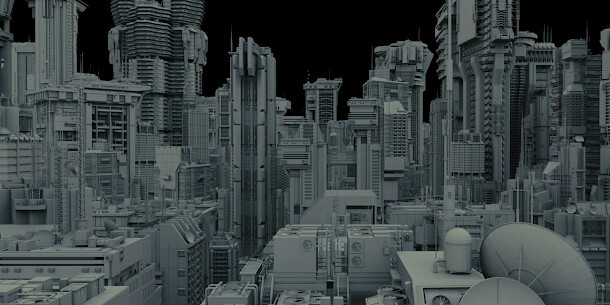 For the movie, the studio recreated Los Angeles as a megacity stretching from San Diego to San Francisco, with outer slums inspired by the favelas of Mexico City, and inner tower blocks insipired by Soviet brutalism. Sadly, the video has since been taken down from Vimeo, although you can still find it rehosted on YouTube. However, Isotropix has an interview with CG supervisor Rhys Salcombe, which covers similar ground. Tech notes: DNEG created 15 hero and 200 generic CG buildings. These were placed by hand, for a total of up to 600 billion polygons per shot, converted to point clouds, and exported to Clarisse for rendering. Pixar usually doesn’t post conventional CG breakdowns of its animated features, but thankfully, it does share demos of the new technology that powers them. In this video – part of a talk from Siggraph 2018 – senior software engineer Andrew Butts shows the new hair workflows from Incredibles 2, editing Elastigirl, Violet and a lovingly scruffed-up CG raccoon in real time. Tech notes: Thanks to advances in compute performance, Presto, Pixar’s in-house CG software, now lets character artists interact with every hair eventually rendered live in the viewport, not just guide hairs. While last year’s winner, the previously unconquerable Game of Thrones, featured among 2018’s most popular broadcast breakdowns, another long-running show took the top spot: AMC’s The Walking Dead. Goodbye Kansas Studios posted a number of breakdowns of its work on the show, but the most popular – or at least, the most gruesomely compelling – was this one of CG zombies being turned to mulch in a grinder. Tech notes: ZBrush and Blender were used to retopologise 3D scans of the actors on which the zombies were based. Blender was also used for hair grooming. Simulation and rendering were done in Houdini. By far the year’s most popular commercial breakdown was Psyop’s making-of for JBL ‘Chameleon’, the story of a love affair between the titular reptile and JBL’s colour-changing speakers. The show-stopper is the look development process, with variant colour schemes – both natural and decidedly not – applied to the CG chameleon through a mix of conventional texturing and camera projection. Tech notes: Psyop created its own scale-generation algorithm inside Maya, merging it with a curve-based grooming system to enable its artists to control the flow of scales on the chameleon’s body precisely. Goodbye Kansas Studios pulled off the unusual feat of topping two separate categories in this year’s list – and did so with projects based on the same source material. As with its work on The Walking Dead TV series, the firm posted a number of breakdowns from its teasers for Overkill Software’s first-person shooter, of which this one for the ‘Aidan’ trailer was the most popular. Tech notes: ZBrush and Blender were used for up-resing the game assets. Yeti was used for hair set-ups. Characters were textured in Substance Painter, animated in Maya and rendered in V-Ray. Created for the Motion Response strand of Australia’s Pause Fest, motion designer Taehoon Park’s ‘Dreaveler‘ depicts a future in which humanity has extended its lifespan near-infinitely. The titular ‘death management company’ enables those who wish to die to navigate their memories one final time during euthanasia, as depicted in the beautiful, eerie video above. Tech notes: The short was modelled and animated in Cinema 4D, with Photoshop used for 2D work. It was rendered in OctaneRender and composited in After Effects. Created by a team from top French animation school MoPA, Hybrids swept the boards at awards ceremonies this year, winning not the student award at Siggraph’s Computer Animation Festival, but overall Best in Show. Populated by a menagerie of sea creatures whose flesh blends with man-made trash ranging from tin cans to car radiators, the finished short forms a visually compelling plea for cleaner oceans. Tech notes: Creatures were sculpted in ZBrush, textured in Substance Painter, then animated in Maya, using crowd plugin Golaem and Houdini for effects. The short was rendered in Arnold and composited in Nuke. Hyderabad-based VFX house The Cirqus’s 10-second character demo – you can find it via the link below – shows a photorealistically rendered wolf emerging from the shadows and snarling. The making-of, which builds the CG creature up in layers, through its skeleton, musculature and skin to the final fur groom, is actually marginally longer, but no less simple – and no less beautifully done. Tech notes: The wolf was modelled and animated in Maya. Muscle and skin simulation uses a proprietary in-house system. Mari was used for texturing, Yeti for the fur groom, and Arnold for shading and rendering. To judge from the other videos in this year’s shortlist, two things are required to create a winning tech demo: a lovingly detailed simulation, and a compellingly strange subject. 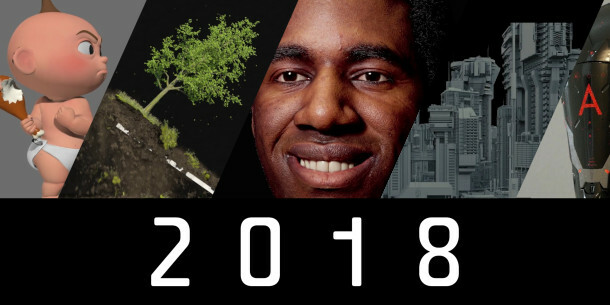 NoEmotion co-founder Peter Sanitra’s demo ticks both boxes, consisting of a series of beautifully simulated trees being uprooted, centrifuged and flung against walls, for the benefit of a simulation-hungry audience. Tech notes: Simulation was done in Houdini, using Bullet for rigid body dynamics, the Wire Solver for twigs and grass, and POP Grains and Pyro FX for soil and dust. The demo was rendered in Redshift. We’ll admit that we may be biased here, since Gnomon, where Stefan Kang was a student when he created this Best of Term Award-winning short clip of a DNA degradation effect, owns CG Channel. It is, however, a beautifully detailed demo, packing in a lot of information on the growth simulation, procedural texturing and surrounding fluid sim – and it does so in just 45 seconds. Tech notes: Simulation was carried out in Houdini, and the finished shot rendered in Redshift and composited in Nuke. For more details, just watch the demo itself.